Body Editor is the best photo editor for body shaping. With body editor tools, you can enlarge breast, enhance hip, shrink waist, slim face, increase height and slim body. You can also add six pack abs, chest, muscles and tattoos to your body. Just few touches, you will be fitness model. 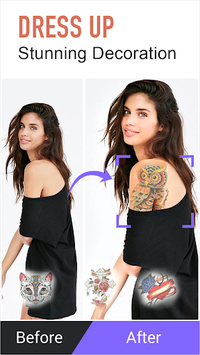 Body Editor is a magic body shape editor for every girl. It can help you reshape body curves with breast enlargement, hip enhancement, face slimming & waist slimming. Increase height with Height Correction tools. Slim body with Slim Down tools, slim and skinny. Edit body with six pack abs stickers, muscles stickers, chest stickers, add tattoo to your body, change your hair, beard, mustache, etc. Enlarge breast naturally. It’s the best breast enlargement tool to increase your breast size. Body Editor offers many surgery menu including Breast, Hip, Waist, Face, Height, Slim. Create photo collage with hundreds of layouts in seconds. Edit photos with filters, stickers, texts and much more. Change your body, reshape your body, perfect your body with Body Shape Editor now.